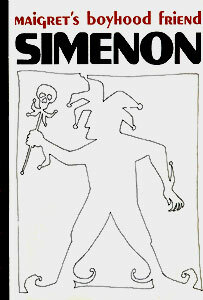 Tout Simenon (PDLC '91-'92): Tome 14, pp. 339-445 (107pp). A schoolmate of M's from the Lycée Banville, Léon Florentin, whom he hadn't seen for 20 years since he'd met him by chance one day on the street, appears in M's office. He'd been the class clown, a habitual liar. He tells M that the woman he'd been living with, Joséphine Papet has been murdered. She had had five lovers, and eventually M learns who they were. Victor Lamotte, a winegrower from Bordeaux, Fernand Courcel, a businessman who lived in Rouen, François Paré, of Versailles, who worked in the Ministry of Public Works, Jean-Luc Bodard, a young insurance salesman, and Florentin. Except for Florentin and Bodard, they'd each thought they were the only one supporting her. Florentin claims he was in the apartment and hid when he heard someone at the door, remaining hidden till the man had left 15 minutes later, and finding Papet, shot. All deny any connection. The concierge, Mme Blanc, a stubborn mountain of a woman, maintains that no one but Florentin had gone up, but M isn't convinced. All had the opportunity. M has them all meet in his office, including the concierge, for a confrontation, and waits to see if there are any results. Mme Blanc eludes the inspector following her, and M realizes the implications. Armed with a search warrant he discovers 2,200 francs in her apartment. She'd been bribed to keep quiet, and after the confrontation realized she could get more. M interrogates Florentin once more, realizing that his story didn't ring true. The man who had come, Victor Lamotte, had come for Florentin, who had tried to blackmail him with letters he'd sent Papet. Lamotte had lost his temper and grabbed a gun from her drawer, and accidentally shot her while threatening Florentin.